The Amplify Console enables developers building apps with the Amplify Framework to continuously deploy updates to their backend and frontend on every code commit. With the Amplify Console you can deploy serverless backends with GraphQL/REST APIs, authentication, analytics, and storage created by the Amplify CLI. Note: This feature only works with the Amplify CLI v1.0+. In this tutorial, we are going to create and deploy a React app which implements a basic authentication flow for signing up/signing in users as well as protected client side routing using AWS Amplify. If you are using another frontend framework or Amplify backend category, the same steps can be applied to deploying your backend and frontend with the Amplify Console. The final code for this project is available as a sample on GitHub. 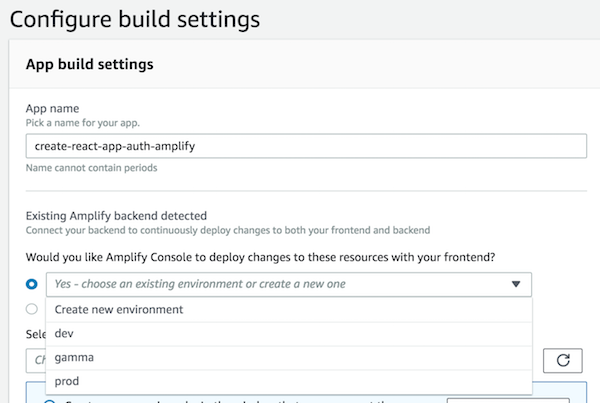 If you already have an existing Amplify app, please jump to step 6. Install the Amplify CLI to initialize a new Amplify project. Initialize the CLI at the root of your project and name your environment prod. You can use the Amplify CLI to add backend functionality to your app. Backend functionality includes all cloud categories such as authentication, analytics, APIs, and storage. 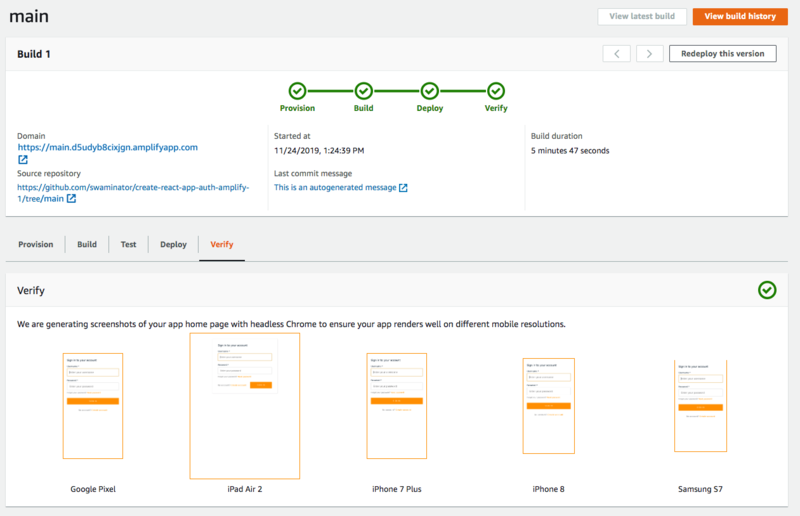 Add authentication with sign-in, sign-up, multi-factor auth to your app. Accept all defaults and push the updated project configuration to AWS. It will deploy an Amazon Cognito resource that enables user authentication. Update your frontend code to add the withAuthenticator HOC component to your App.js as shown here. Test your app locally to make sure you see a sign-in screen. Commit your code and upload it to a Git provider of your choice (the Amplify Console supports GitHub, BitBucket, GitLab, and AWS CodeCommit). Log in to the Amplify Console and choose Get Started under Deploy. Connect your Git provider, repository and branch and then choose Next. The Amplify Console automatically detects that your repository has an Amplify backend. From the dropdown, choose prod (the environment you just created with the CLI). This will cause the Console to automatically update the prod backend anytime you commit changes to your repository. Choose Next and Save and deploy. Your app build will start by deploying the backend followed by the frontend. Click on your branch name to see the running build. When your build succeeds, you should be able to access your app.